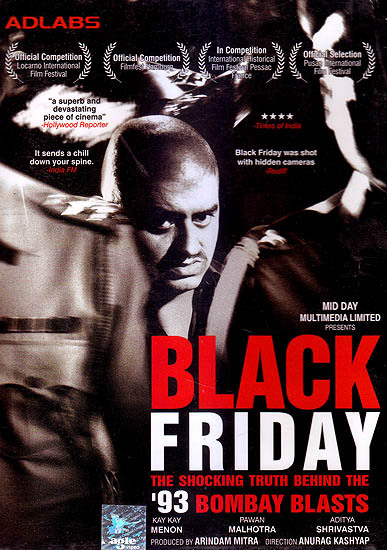 Black Friday is the story of the 1993 bomb blast that took place in Mumbai. Based on a book by S. Hussain Zaidi this docu-drama tries to recreate those events and the intense feelings that followed them. The film has Kay Kay Menon (as the Commissioner of Police) Aditya Shrivastva as Badshah Khan and pawan Malhotra (as tiger Menon) among the star cast. On march 9, 1993 gul mohammed turns himself in at Nav Pada police station, Bombay. His statement there is a conspiracy underway to bomb major locations around the city. The police dismiss his confession. Three days later Bombay city is to torn apart by a series of explosions. The death toll is close to 300. Investigators discover that the bombs were made using a high powered explosive, RDX it could only have been obtained through the collusion of a foreign power. And a large amount of illegal money. Leading to Friday March 12 1993 Twelve explosions at key points around the city 300 people dead 800 injured and a trial that awaits verdict.